Matthew McConaughey gives voice to Buster Moon, a dreamer who thought he’d be much bigger in the theatrical world than he is. Put it this way: he’s no Ziegfeld. To save his theater he decides to mount a production that is guaranteed to pack the seats: a singing competition, to which all the friends and relatives of the entrants will come. Yep. 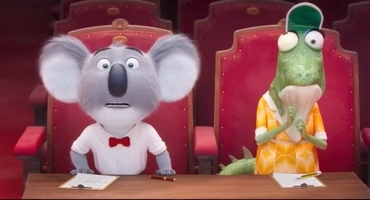 It’s basically an extended animated animal version of The Voice or America’s Got Talent. Failure hangs on Buster like a cheap suit, so he coaxes his friend Eddie (John C. Reilly), a sheep who isn’t afraid of going against the flock, to ask his retired legendary singing grandmother, Nana Noodleman (Jennifer Saunders), to sponsor the competition. She won’t do that, but she agrees to see a preview of the show. As in Nativity! disasters threaten to cancel the show, but hey, the show must go on, and it does. A sequence that emulates a fast-moving drone camera introduces us to the contestants and prepares us for a narrative that will shift from character to character. Rosita (Reese Witherspoon) is this film’s Miss Piggy, a housewife who has a brood of 25 piglets and a dream of making it in music; Johnny (Taron Egerton) is a gorilla whose criminal dad wants him to follow in his footsteps instead of pursuing a career in entertainment; Ash (Scarlett Johansson), is a porcupine rocker who splits with her boyfriend in order to prove she can do it on her own; Gunter (Nick Kroll) is a German piggy who seems trapped in the age of disco; Mike (Seth MacFarlane) is an old-school crooner of a mouse who plays guitar on the street for spare change; and Meena (Tori Kelly) is an extremely shy elephant who has more stage fright than talent, and her talent is considerable. All of the characters are fun, but the scene-stealer is Buster’s elderly lizard assistant, Miss Crawly (“Has anyone seen my glass eye?”), voiced by the film’s writer-director, Garth Jennings. Miss Crawly’s eye plays a big role too, as it’s responsible for adding a few zeroes to the amount of prize money advertised on fliers—the main complicating factor in this otherwise thinly plotted film that’s really all about the performances. 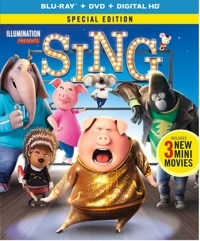 Sing features snippets and extended renditions of 65 different songs, some of them performed by the actors, and the rest of the soundtracks covering a wide range of styles and talents, including Maino, Cat Stevens, Dave Brubeck, Crystal Stilts, Dennis de Laat, Ennio Morricone, Boomish, Carly Rae Jepsen, Major Lazer, Cyndi Lauper, Kanye West, Luciano Pavarotti, David Bowie & Queen, Katy Perry, Spencer Davis, Drake, Gipsy Kings, Wham!, Stevie Wonder, and Ariana Grande. 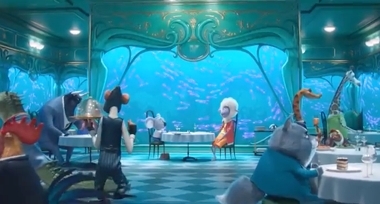 The music is one reason this film works; animation is the other. 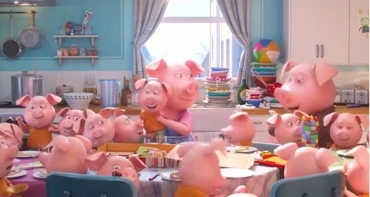 For decades Disney has been the absolute best at creating a world, but Illumination pays just as much attention to background details and small jokes and gets it right. They bring to life a world that gives pleasure just to look at it and to appreciate those details. If this were live-action, I think it would be a yawner. Even Glee had more plotting. But the animation sells it and makes it entertaining for all ages, despite the tired premise. And for children, the message is as hopeful as The Voice: if they can pursue their dreams, so can we!